A quiet Expo Hall…for now. 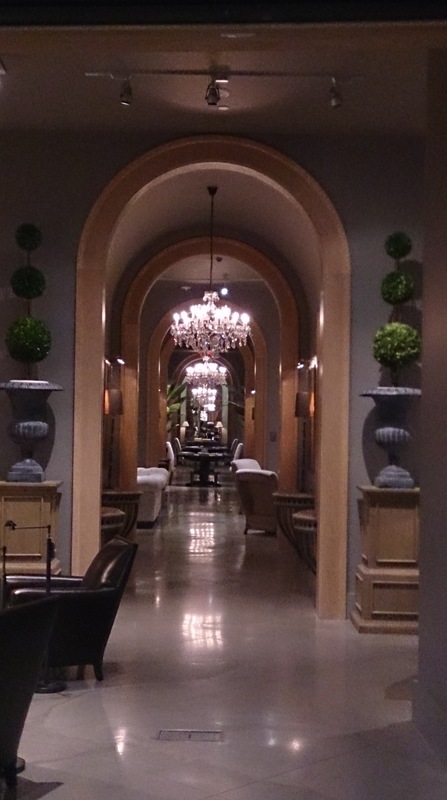 I’ve done the serious and the sightseeing… now it’s time for a quick synopsis of my explorations of the Expo Hall. Last week I mentioned how the bloggers had a privileged tour of the Hall before Thursday’s Keynote Speeches. From then on it was busy, busy. I had looked at many of the companies’ websites, prepared a checklist, and highlighted a map of booths I didn’t want to miss and that worked well. I confess I didn’t spend time listening to the mini-presentations in the Expo Hall as there never seemed to be enough time. I do have membership with most of the big geneaproviders so have a good idea of where they’re at. However I did come along to hear the Find My Past speaker telling us what they were planning for Irish records, and let me tell you, they will have us dancing jigs when they arrive. I’ve been with FMP since way back, and totally enamoured of their recent Friday releases. It’s plain they don’t intend letting their game down. 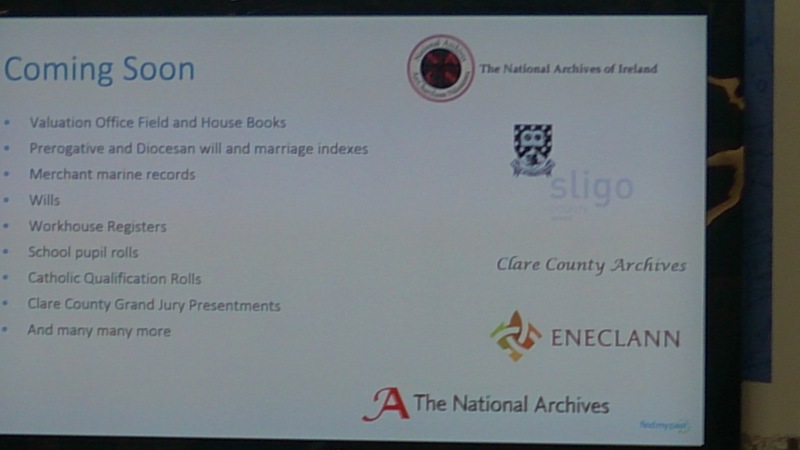 Here is a copy of the slide which they showed listing upcoming Irish resources in coming months (and yes, I did ask permission to use it). Just imagine what might be in there for the Irish diaspora. Loved their badges with Kiss me, my ancestors were Irish/English/Scottish/Immigrants etc. I had Write Meaning on my checklist and was lucky enough to find Nancy Douglas free, thanks to a mistake I made with scheduling. Nancy gave me a specific piece of text to handwrite in cursive, plus a couple of images to draw (I am so not an artist). She then analysed my writing and drawings using her experience as a certified handwriting analyst. Initially I was a bit nervous but the experience was very positive, though with a couple of family surprises. It was well worth my $US20 investment. The business also offers the opportunity to have your ancestor’s writing analysed which I think would be both fun and helpful – just need to find something I am certain they personally wrote…for those who could write. Thanks Nancy for a fascinating interview. Tahitia McCabe who was representing the Uni of Strathclyde. 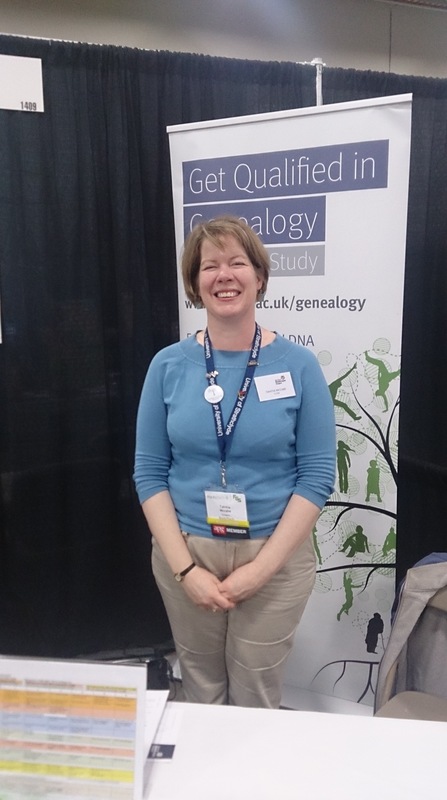 I wanted to look at three stands: Board for Certification of Genealogists, the University of Strathclyde, and the National Institute for Genealogical Studies. I know friends who are doing NIGS units but no one so far who’s doing Strathclyde’s program. At present I’m not in a position to commit to any of these – family obligations – but I will be giving them some serious thought. 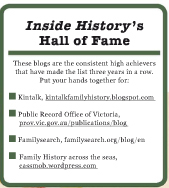 I was also interested in the Association of Personal Historians – another to consider. I decided to purchase an Ancestry DNA kit while I was in the Expo Hall and have returned it, as I believe we can’t yet get them opin Oz. Apparently the results will be ready in 6-8 weeks. It will be interesting to see how it compares with my Family Tree DNA tests. I hope it was worth the sacrifice of not buying that nice coat from Macy’s <smile>. 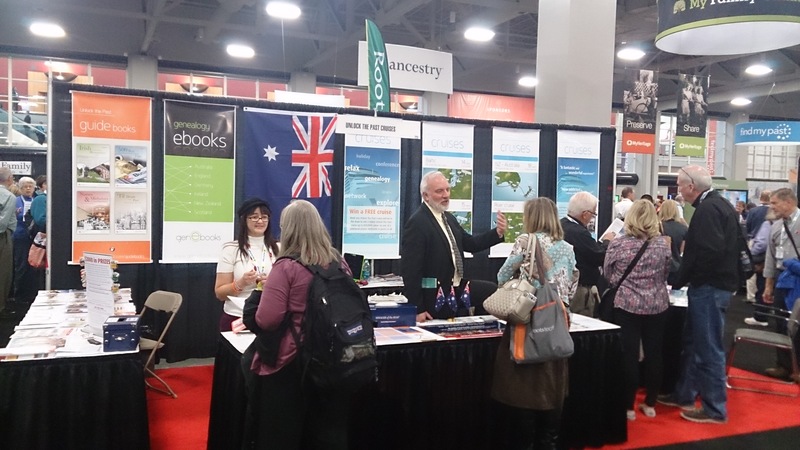 You can read what I wrote about my RootsTech/FGS genetic genealogy learning here on the Worldwide Genealogy blog. 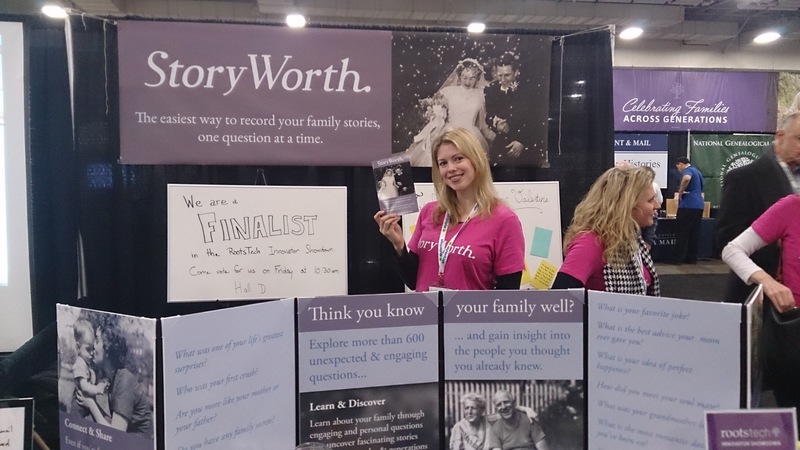 Hope and team from StoryWorth. Of course I’ve already mentioned StoryWorth and what a pleasure it was to meet the team, especially Hope with whom I’d been in email contact. I’ve got my other half signed up with their program. I think it’s an easy way to get answers to questions in bite-sized chunks. We had a good chat with Laura and I got her permission to use this photo. Thanks Laura! I promised myself “no books”, after all I’m trying to declutter, but there were a few I couldn’t resist. I bought Zapping the Grandma Gap (Janet Hovorka), Mind Maps for Genealogy (Ron Arons), and Maureen Taylor’s Family Photo Detective. I could have bought the latter as an e-book but my photo books are among my most-used resources so I went for a hard copy. I just had to check out Eneclann which publishes great Irish books and CDs, more and more of which are available as downloadable e-books once purchased. Lisa Louisa Cooke from Genealogy Gems was on my visiting list and she kindly agreed to be photographed with me. I had already been to a couple of sessions she presented. Of course I had to visit with Alan and Alona at Unlock the Past Cruises. Flying the flag at Unlock the Past Cruises. The Media Hub was in the midst of the Expo activity and there always seemed to be a genimate to wave to. Thanks Thomas MacEntee for my fab ribbons! And the (free) Soda Fountain had great lemonade to wet one’s whistle, and was always popular. One of the American traditions, which doesn’t happen in Australia, is the supply of ribbons and buttons to add to one’s bling. It might look a bit silly from the outside but is good fun. 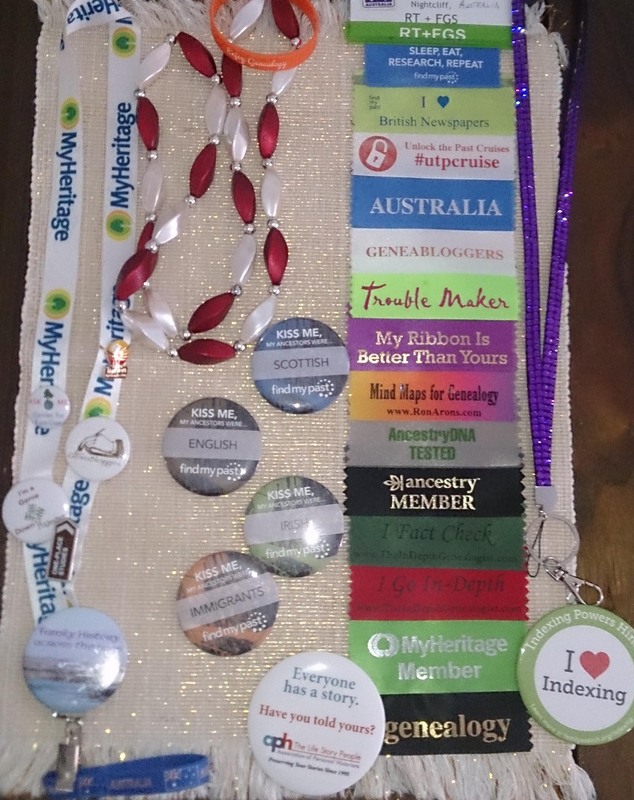 The Geneabloggers’ beads, provided in 2015 by Dear MYRTLE and Cousin Russ, got comments from lots of people and made it easy to identify fellow bloggers. I was surprised how small a drop we were in the ocean of attendees. I was tickled to bits when a coincidental conversation revealed the lady had read my Worldwide Genealogy post thanks to Randy Seaver’s Best of the Geneablogs 18-24 January 2015. The Aussies contributed their own bling to the event with people taking Aussie stickers, koalas, tourist pins, and pens/keyrings with Aboriginal patterns. The recipients were really surprised and enjoyed sharing a bit of Down Under. That’s a wrap from me for Roots Tech. There’s so much more I could share but other commitments are calling. 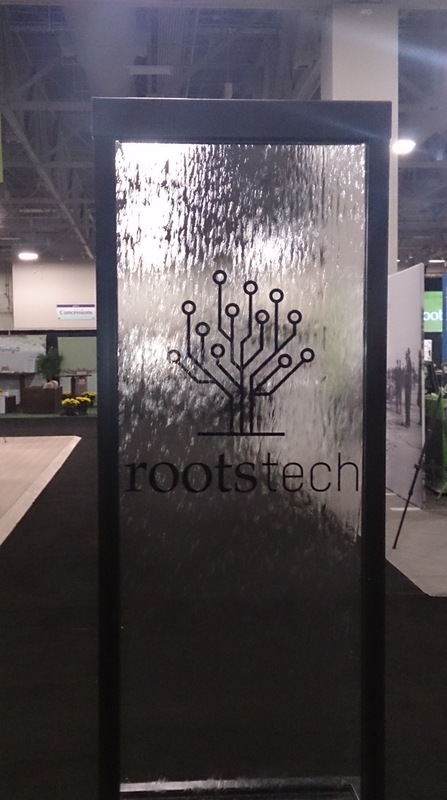 Don’t forget to check out the RootsTech Video Archive and consider purchasing a couple of FGS audio recordings (click through the 51 options). I’m sure you won’t be disappointed. Randy Seaver, blogger extraordinaire at Genea-Musings, is keeping, and updating, a consolidated list of all blog posts relating to this record-breaking event. Thanks Randy for making it so much easier for us all to check our people’s experiences and learn from them. It was such a lot of fun, especially catching up with my genimates, and meeting new ones. When you have less than a week to fit in four conference days, three visits to the Family History Library, and lots of socialising, there’s not much time left for actual sightseeing. I notched up some distance to-ing and fro-ing and along the way took shots that caught my eye. Here are some of them. My SLR is playing up at present so I took these with my phone camera. 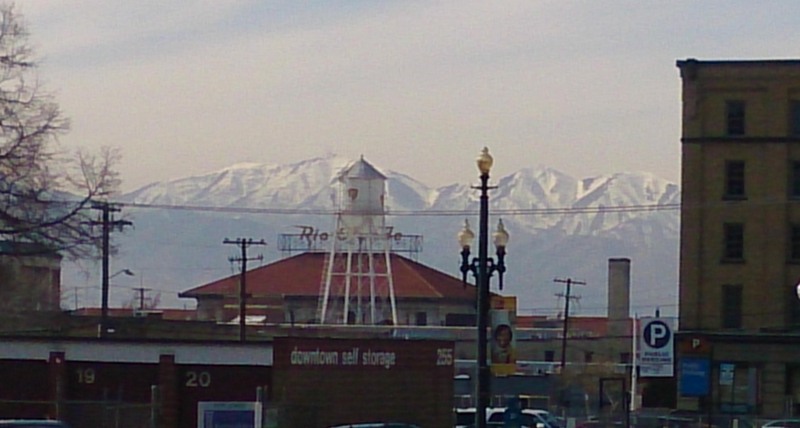 View from my hotel room – isn’t it pretty? 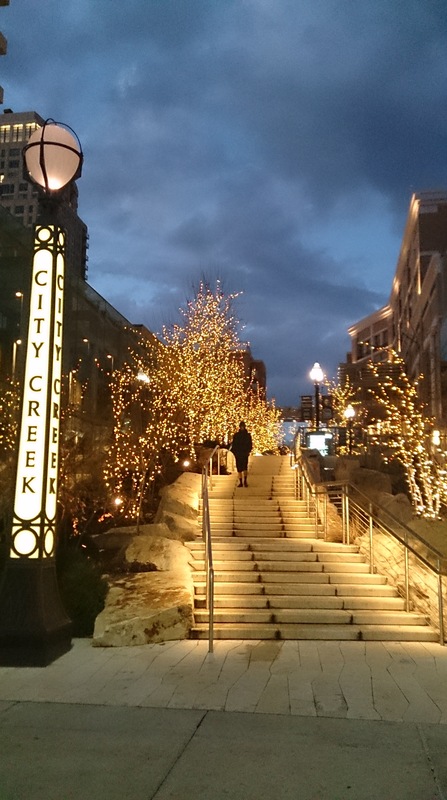 One of the entrances to the City Creek shopping mall…just up the road. 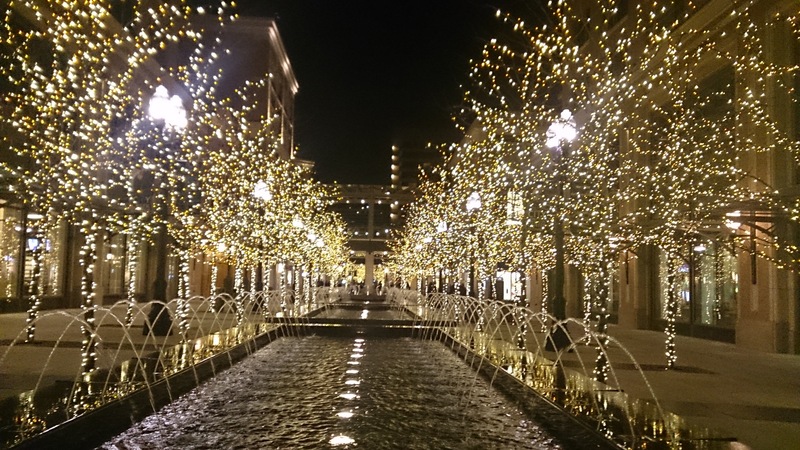 The creek which runs through the shopping complex. 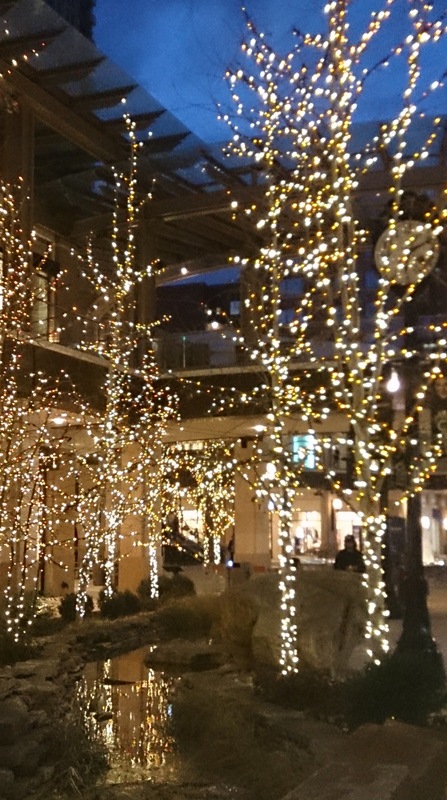 I just love fairy lights when it’s wintertime overseas. These were a mix of white and yellow. Looks like it belongs in France to me. 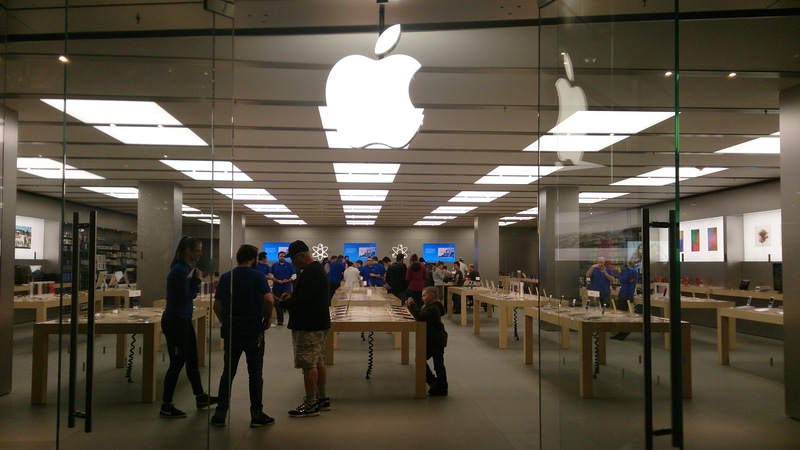 Now THAT’s an Apple shop! Abravnel Hall, Centre for the Arts. I liked the sun on the red art work and the rather Expo-ish street art. 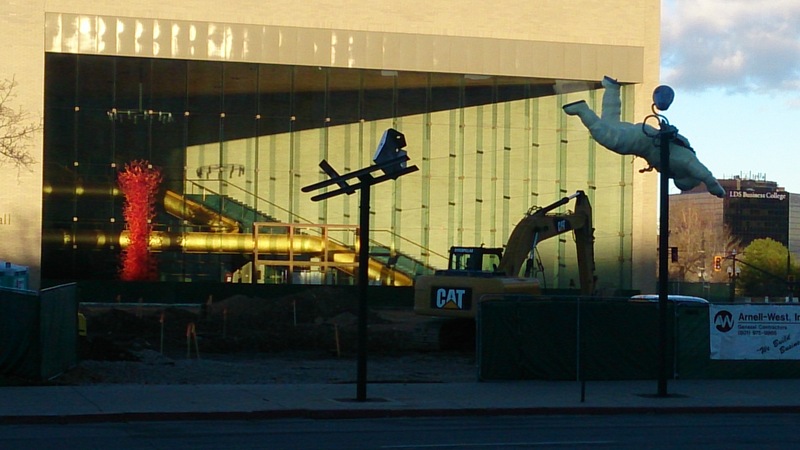 The impressive entry to the Salt Palace Convention Centre – site of RootsTech and FGS. Liked this quirky construction framed by the mountains. 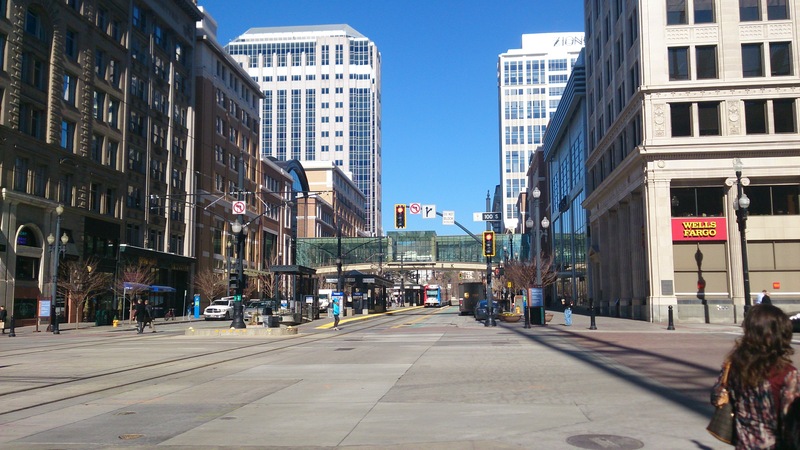 I was surprised how quiet the streets were in SLC. You can see the Trax arriving in the centre of the road. Do join me for Part 2 of my Incidental Sightseeing tomorrow. 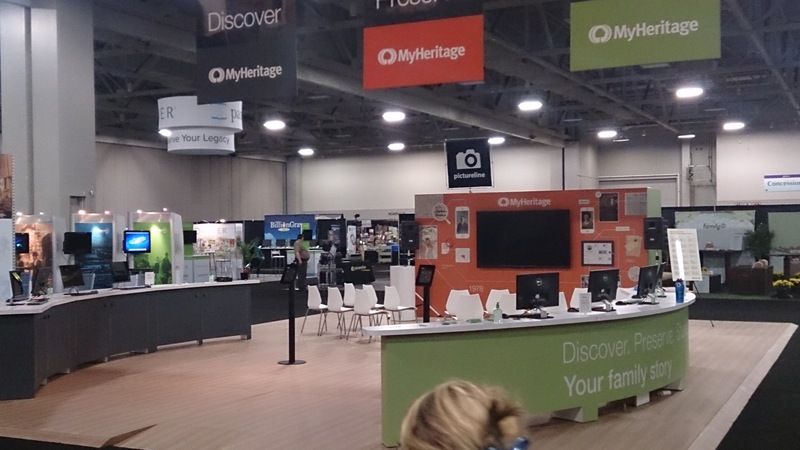 My genimate Jill Ball (GeniAus) was generous enough to invite me to participate in an interview with Congress 2015 speaker, Josh Taylor at the combined RootsTech/FGS conference in Salt Lake City. It was my first experience of being interviewed, and interviewing, in a proper sound booth so that was fun…and slightly intimidating at first. Jill will be sharing the Josh Taylor video on her blog in the near future, so I won’t share any spoiler info with you. UPDATE: Here is the link to the interview Jill and I did at RootsTech. However, I did want to whet your enthusiasm further for Congress by sharing Josh’s online RT/FGS conference presentation about “30 pieces of tech I can’t live without”. I wonder how many of them you use and what you (and I) will try after viewing the video? One of the things I like about the blogisphere is the sharing of tools, tips and techniques we use for our genealogy – so many of Josh’s tips were among my favourite tech tools. Having said that, there were quite a few other tools I want to try: mood board, flipboard, reddit, trello, some WordPress widgets, snag it and Archive Grid. Oh, and wouldn’t a Hovercam be nice <smile>, As Josh says himself, you have to choose the ones that work for you. I especially enjoyed his comment about why you save five minutes in a library – I could certainly relate to that <hint – about the 8 minute mark>. What I particularly like about listening to Josh is that he’s so passionate about his family history and he “gets” what we’re on about. I was also impressed that he mentioned JSTOR, which we can access through the National Library of Australia with our library cards – make sure you allow time in Canberra to visit the Library. 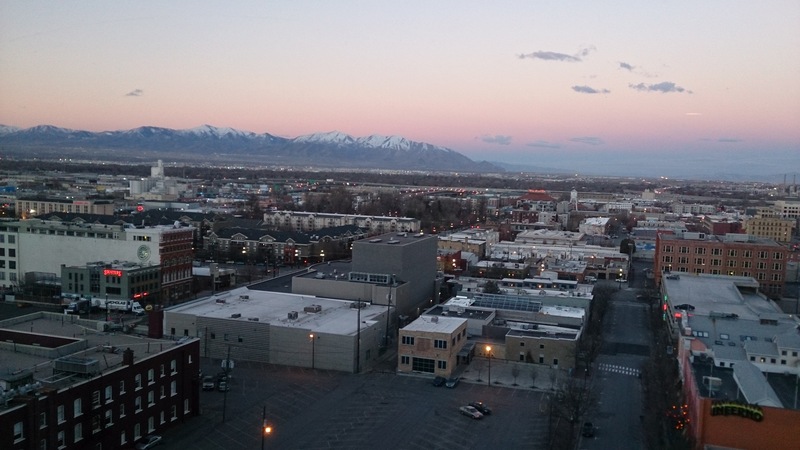 RootsTech has some of the presentations online here and more are expected in coming days. The Federation of Genealogical Societies has their recorded sessions available to purchase for $US10 which I think is a pretty good bargain. I’ve downloaded a couple I didn’t get to and two I did: one on long-distance membership, something of great relevance to me, and a genetic genealogy one I thought was very helpful. More about the latter on my Worldwide Genealogy post today. So if you’ve been feeling left out when following the Twitter, FB and G+ feeds of the 15 Aussies who went to what Jill calls “the greatest (genie) show on earth”, there’s still plenty of opportunity for you to get a taste of the experience. And of course, since you’ll be coming to Congress 2015 in just over a month, there’s lots more ahead for you, including enthusiastic keynote speaker Josh Taylor. Jill Ball has stocked up on blogger beads for the Aussie bloggers so there’ll be plenty of fun in store, as well as all that learning. 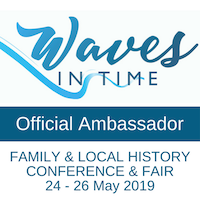 Don’t forget you can read about all our expert speakers through their interviews on this blog and my fellow official bloggers Jill Ball and Shauna Hicks. We’re looking forward to meeting you at Congress and renewing friendships with those we’ve met elsewhere. 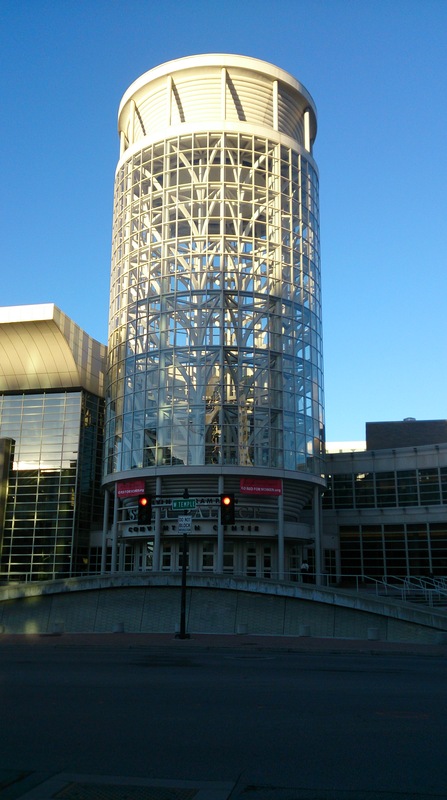 The geneaglobe is abuzz this weekend with planning for the combined RootsTech and (US) Federation of Genealogical Society Conferences in Salt Lake City. While the start date is still more than three weeks away, we Antipodeans will likely be heading off a little earlier. For my part I’m leaving Mr Cassmob and the Furry Feline at home minding the house and having a few days in Brisbane en route. However, on the way home it will be a very long-haul flight from Salt Lake to LA to Brisbane to Darwin, a mere 33 hours in transit. Gee I’m glad I worked that out! Patience packed…oh well, this might be a stretch. SIM cards for smart phone & iPad. US adaptors and charging cords. ID protector pockets for passport and credit cards (thanks Gail for my birthday presents). In-flight reading, books and podcasts on iPad…oh yes, I’m supposed to sleep. 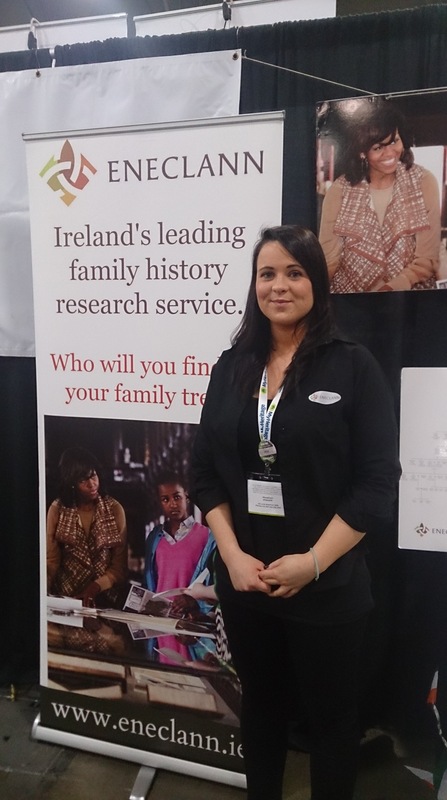 RootsTech App downloaded and profile updated. Thanks to genimate Caitlin Gow for helping me sort out my profile picture (click on the shaded face outline then load a photo). Add friends as they come online: there seem to be huge gaps at present. 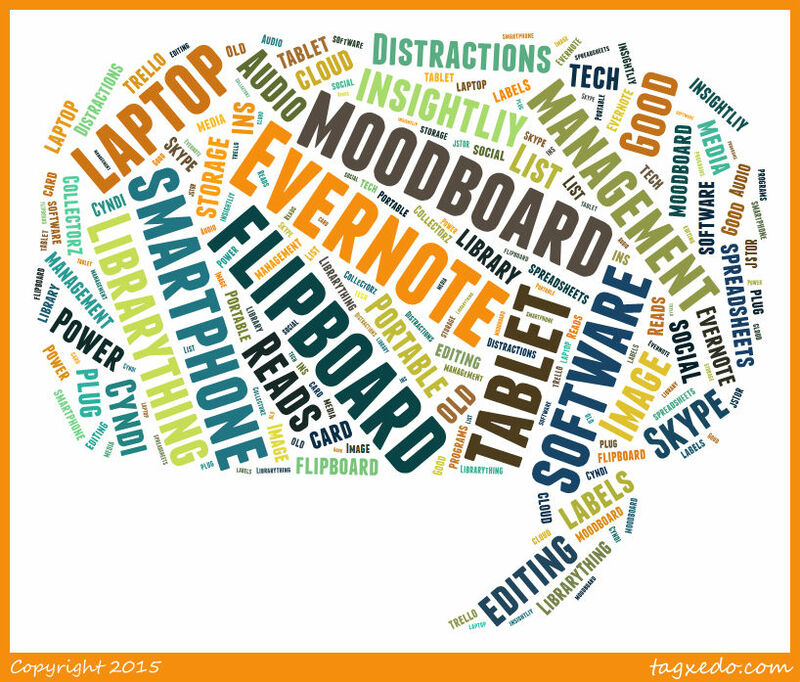 Work out which sessions to attend: lots of competing entries for me so far between FGS and RootsTech. It would have been ideal, as mentioned elsewhere, if the schedule had included the earlier FGS start. 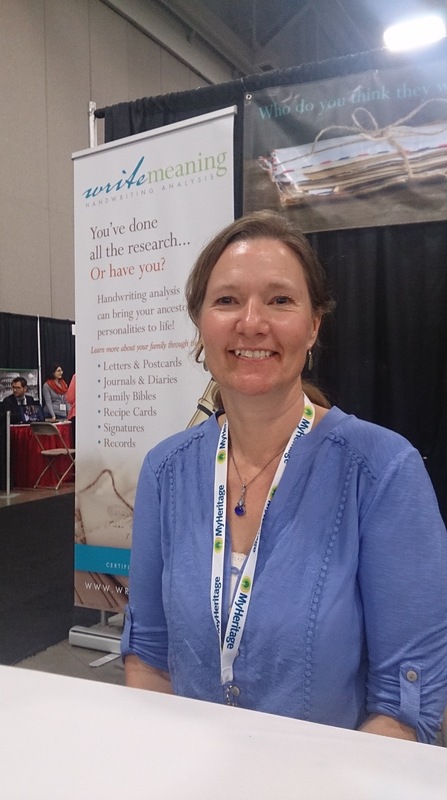 Sign up for the Geneabloggers at RootsTech Facebook group (I hadn’t known this was here but am now online, thanks Heather. You do need to be a geneablogger.) It’s a great way to connect with people in advance. 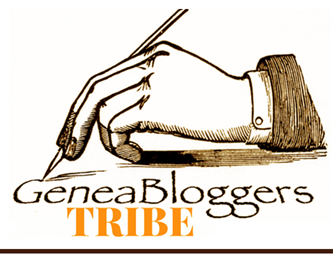 Sign up with Geneabloggers’ Thomas MacEntee for your blogging beads. (Thanks to DearMYRTLE and Russ Worthington for sponsoring the beads). Prepare a list of things to search in the Family History Library: I’m focusing on books rather than microfilms which I can order in here and which take a lot of time to review thoroughly. Work out my schedule so I can fit in more visits to the library after hours. Pray for minimal jet lag so I’m functioning on arrival <smile>. Business cards for my blog with family names on reverse. Badges with my family names and places. Bubble wrap and zip lock bags, as usual. Dilly bag featuring my blog name (from Vistaprint). I wouldn’t mind seeing an at-home game for the Salt Lake City Jazz NBA team but don’t think that they’re around…shame. Boring but necessary. I’ll be going from 25-35C (or 85-95F) to -2 to about +5F so there’s quite a change. I’m telling myself we’ve often travelled in winter so it will be fine. Lots of layers, a pashmina or two, coat, scarves, walking boots and hat: that should cover the extras.. a challenge for someone who lives in shorts and tank tops! 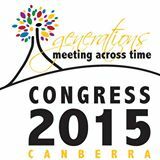 The good thing is all this will be good preparation for AFFHO’s Congress 2015 in Canberra. I’m looking forward to it and it will be so interesting to see conferences on a scale which are impossible in Australia.